Cast in Stone, Make Your Own! 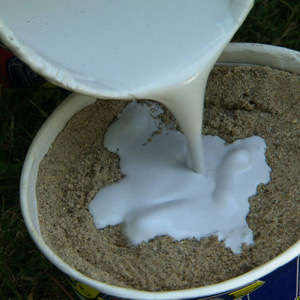 Place 4 spoonfuls of dry plaster of Paris in each cup. Squeeze the clay until it is pliable. Place a flat disk of clay in at least five of the egg carton openings. Coat one side of the object with petroleum jelly. Press the lubricated side of the shell into the clay. Carefully remove the shell from the clay. Place two spoonfuls of water in each cup and stir until smooth. Pour the plaster mixture into the shell imprint in the clay. Note: Throw the cup and spoon away and do not wash any plaster down the sink as it can clog the drain. Allow the plaster to harden to harden overnight. Remove plaster from clay and observe your cast fossil. Initial the back of your fossils and set them out for other student scientists to observe. Observe the fossil samples around the classroom, both student made and teacher provided. Record at least 3 factual observations about each fossil and make a hypothesis about how or what "formed" that particular fossil. Record all observations on a Word document. Be sure to save it to your desktop as "Fossil Observations."